If Your Garage Door Won’t Open All the Way, Here's How to Fix It. When your garage door won’t open all the way, it can be quite an inconvenience. Not only will this keep you from getting your vehicle in and out of your garage, you’ll also have a harder time accessing everything you have stored in there. If this happens to you, don’t immediately call a professional. First take advantage of these tips and see if you can solve the problem yourself. By doing so, you’ll just might save yourself a lot of cash. The first thing you’ll want to do when your garage door opens a little and then stops is to check to see if there is anything obstructing the lenses. Your garage door will immediately stop and close if anything is in the field of view of the lenses. It’s also a good idea to take a damp cloth and wipe off the lenses. Overtime, spiderwebs, dust, and other filth can accumulate on the lenses causing the garage door to malfunction. In addition to obstructions, you’ll also want to check the lock button. Most garage door openers have a lock button or a switch that will cause the garage door to stop and sometimes close. If you’re not sure where the controls for this are or how to turn the lock feature on and off, you’ll want to consult the owner’s manual. If you’ve checked for obstructions and made sure the lock button wasn’t switched to the ‘on’ position, and still your garage door opener won’t open all the way, check to see if your garage door is balanced properly. If your garage door is not balanced right, it won’t go up or down all the way. To check the balance, pull the emergency release cord or chain to disconnect the door. You should now be able to move the door up and down by hand. From here, lift the garage door by hand about 3 feet above the ground and then release the door and see were it lands. If the door lands in the same spot you pulled it up from, then you know it’s balanced. However, if it doesn’t, then you know it’s off balance. If your garage door is off balance, the problem could mean that your opener simply needs to have the simple travel limit or the force limit adjusted. For those that are unfamiliar with these settings, the simple travel limit setting determines how far up and down your garage door opener will go. The force limit setting determines how much pull will be used to get the garage door fully open. Start by making sure that the emergency reverse works the way it’s suppose to. This is for your own safety and will help prevent your garage door opener from getting damaged as well. 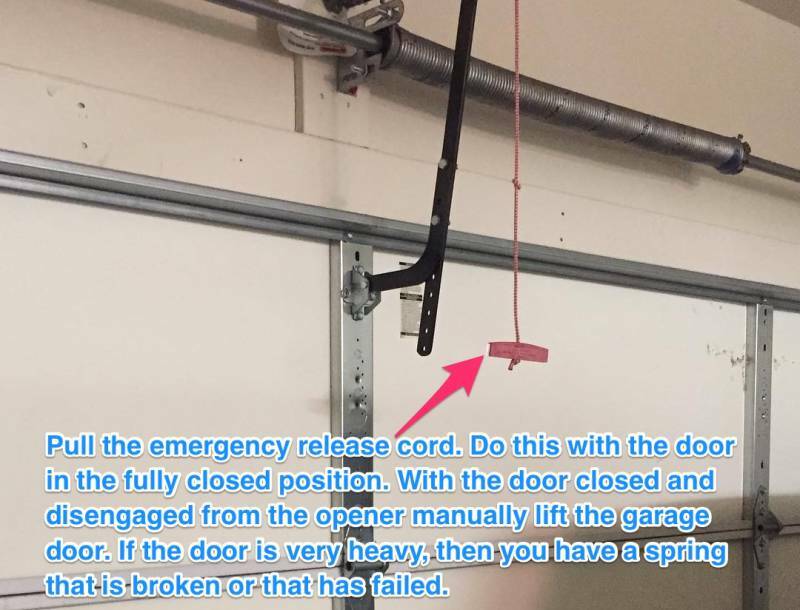 After you have made sure this works, locate the release cord and disconnect the garage door if you haven’t already. You’ll need to have the garage door closed to do this. After you have disconnected the garage door, adjust the simple travel limit or the force limit until your garage door is balanced properly. If you’re unsure how to do this, consult the owner’s manual. 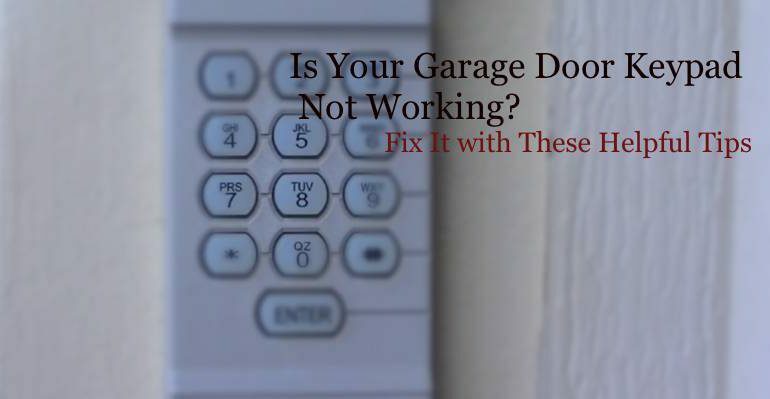 Depending on what brand and model of a garage door opener you have, you’ll make these adjustments by either turning the screws located on the side or pushing the colored buttons. If your garage door still only opens partially, then try adjusting the travel and force settings a little more. When you tried to lift your garage door after you disconnected it, was it was too heavy to lift? If so, this means the springs are probable broken. Broken springs can cause a garage door to open and then quickly shut. If your garage door springs are broken or simply not working the way they’re suppose to, you’ll want to call a professional unless you really know what you’re doing. Why? Handling these springs can be quite dangerous and have been know to cause injury and in some cases death. A faulty logic board could also be a reason your garage door opens then stops. This board electrically controls your garage door and will fail if it shorts out. Depending on how old your garage door opener is, you may want to replace it if it’s old. On the other hand, if your opener is fairly new, you may want to call a professional. Plus, depending on the brand and model, you may be able to take advantage of the warranty and get it fixed for free.